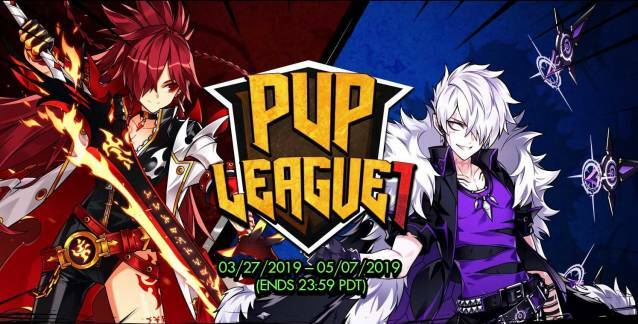 Irvine, Calif., April 3, 2019 – KOG Games, a leading developer and publisher of popular free-to-play action MMORPGs for WW less Europe, has kicked off ElsWord's PVP League 1. The International 2v2 PvP League Tournament Series is the North American beginning of Elsword's first ever, International PvP event! Representative, 2v2 teams from multiple countries will go head to head to determine, once and for all, who has truly mastered the art of combat, and which team will walk away with the title of Best ElsWord PvP Team in the world. The first season will last until May 8. The second season will begin on May 22 and conclude on July 3. The third season will begin on September 11 and end on October 23. At the end of each season, prizes include up to 30,000 K-ching. The Team that wins the third and final PvP League Tournament will be selected to represent Elsword NA in the Elsword International Tournament. In order to participate, every player must be within the top 32 of each season. To celebrate the launch of the new season, all players level 10 and up can complete a new chain quest to earn special rewards. The event ends at 11:59 PDT on April 9. Players can also enjoy new PVP features including 1vs1 Random and Team Random match types in the Practice/Free Channel as well as a 'Rest Before a Rematch' rebuff when you find a match in the Arena. ElsWord is a free-to-play, 2.5D action MMORPG developed by the South Korean company KOG Studios. It features real-time action gameplay and includes both player vs. environment and player vs. player modes.